2011 Topps Gypsy Queen was one of the year's most surprising baseball products. Although some collectors enjoyed 2010 Topps 206 and 2010 Topps National Chicle, neither did well in the market. So, to say that many were skeptical about 2011 Topps Gypsy Queen might be an understatement. Yet, not since 2006 Topps Allen & Ginter had a set-building product jumped up and surprised so many. Gypsy Queen might have been even more surprising than the debut of Allen & Ginter. 2011 Gypsy Queen was another Topps attempt at a vintage product, an area that some say is overused and abused. With so many products each year, I think it is good to have three or four strong vintage products. Set builders really dig the challenge. Plus, these sorts of sets typically bring fun oddities and nice autographs. I was one of the lucky ones to get in on the 2006 Allen & Ginter ride. Like most other Topps baseball products, I was not going to miss Gypsy Queen either. Originally, it looked like a cross between Topps Heritage and Topps Allen & Ginter. 2011 Topps Gypsy Queen was full of baseball, with lots of short prints (50 cards at 1:4 packs) and heroes of baseball history. Plus, it had the minis and four hits per box. Perhaps another reason some were put off early was the higher case price point with just ten boxes per case. However, within a matter of weeks, cases doubled or more in price. 2011 Topps Gypsy Queen was the first product I was limited on. I had ordered 20 cases, but was limited to 15. I was disappointed but thankful to at least have 15 cases. Most collectors I knew could not find one case. Granted, many were not even looking. This created a very low production run (compared to similar products) and led to wild running prices on the secondary market for both single cards and sealed wax. 2011 Topps Gypsy Queen quickly became one of the most successful case breaks I ever enjoyed. 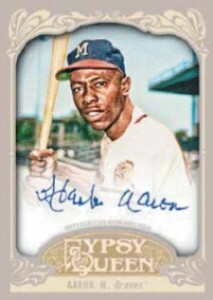 I am more excited about 2012 Topps Gypsy Queen than any other release this year. Do I think it will do as good as last year? Not a chance. However, I feel it will still be strong as it has a similar formula to last year and the initial checklist appears strong. It is still somewhat limited compared to the regular issues of Heritage and Allen & Ginter. This despite the fact that cases seem more readily available this time around. Plus sophomore slumps do occur in this industry. Last year we may have been caught by surprise. But not this year. There will be more of the product out there, although after talking to a group of other major case breakers, I am only aware of one who has ordered more than a few cases. And while we may not see a full repeat of last year's magic, I do expect 2012 Gypsy Queen to still pack plenty of excitement. Returning is the standard 350-card set. The first 300 are considered base cards. These include legends like Mickey Mantle, Hank Aaron, and Willie Mays. Cards 301-350 are considered short prints, which are found 1:4 packs. The base set was popular last year as it took more than a box to put one together. This gave collectors a challenge and made for a power-packed checklist. Expect the same this year. The full 350-card set requires at least a case to complete. Different this year are the insert set themes. Last year the hobby product released three baseball-themed inserts with 75 total cards: Home Run Heroes, The Great Ones and Future Stars. In addition there was one non-baseball-themed insert set with 19 cards, Gypsy Queens (which also yielded a SP parallel version), and two retail-only insert sets totaling 25 cards: Sticky Fingers and Wall Climbers. This year the three hobby-only baseball inserts have shrunk down to just 45 total cards over three sets: Moonshots, Glove Stories, and Slide Show. The additional insert set this year, Gypsy Kings, is based on a mythical 1887 Barnstorming team. It is said to be 12 cards found at a rate of one in every two boxes. There should also be some retail-only insert themes again this year, but we will have to wait and see. Also, the insert cards will have mini parallels (see Mini Cards below). Returning this year are the Framed Paper parallels. Last year, the copper-colored hobby set had 100 total cards that were numbered to 999. Meanwhile, retail had similar green versions. This year the hobby sheets state they will be more limited at just 599 copies and be blue in their framed color. There will also be a 1/1 black frame addition as well. Printing plates also return. Different in 2012 is the full parallel set to the basic cards that were limited to just 10 copies last year. The full 350-card set was paralleled by a stamp card version that commanded strong prices on the secondary market. This year the stamps have been replaced with Indian Head Pennies and are also limited to just ten copies each. Also, it appears that Topps has trimmed down the full 350-card set down to just 100 selected subjects. Expect these to be much more difficult to pull this year, based on the odds. Returning is the full 350-card set in a mini parallel form. The 50 short prints are found just one per box, making it one tough set to complete. Also returning are parallels of the mini cards in the form of Red Gypsy Queen Back, Black Border, and Sepia Tone #/99. And once more, printing plates of the minis will be included. New to this year's mini inclusions are Straight Cut Back and Green Border. The Green Border minis are found just one per box, This makes them twice as tough to pull than the Black Border minis. Gone appear to be the highly collected Leather minis that were #/10 last year. If these are indeed no more, that will be a disappointment to many set and player collectors. Also returning, but with a twist are the hobby-exclusive 10-card mini pack box toppers. Last year, these boxes had six regular base mini cards, plus a mini version of the baseball-themed inserts, and one of 100 different SP variation mini cards. The variations made for one of the toughest non-numbered mini sets produced in recent memory. Topps is changing up these box toppers a bit. A new addition are unframed mini autograph cards, which have at least 15 cards on the checklist, including Frank Thomas. Also, the regular mini cards are no longer included. Rather, there are at seven short print variation mini cards (or six if there's an autograph). According to initial information, the SP variation mini cards have been reduced from 100 cards to 91. Their insertion rate has increased from one per box to up to seven. This will make the set easier to complete. It will also decrease the potential value of the variations. Returning is a strong checklist of autographs and relics that includes many legends, such as Sandy Koufax and Don Mattingly, and current stars. Last year saw an outstanding checklist of retired stars, especially within the framed mini relic set. While the final checklist has yet to be revealed, many big names are included. Hopefully Topps continues with last year's winning formula in keeping the set checklist strong overall. Returning are basic Autograph Cards, Relic Cards, Framed Mini Relic Cards, Dual Relic Autograph Cards #/25, Triple Relic Autograph Cards #/10, and Original Art Patch Relic Cards 1/1. Two new additions are the already-mentioned unframed autograph mini cards found in the hobby-exclusive box topper mini pack. A new Stadium Seat Relic Set has just five cards, each of which are numbered to 100. While I am excited about 2012 Topps Gypsy Queen, I will be anxious to see how well it performs. Not only did the case prices increase slightly, but there seems to be less value overall especially when you figure in that production has increased. Of course, after just one year in release, Topps is revisiting the product's build. The basic concept and inclusions are there for continuity. However, given the production increase, I would have liked to have seen more additions and less subtractions. Little changes can sometimes make or destroy a successful case break. I appreciate the possibility of the mini autographs and stadium seat relics, although I expect both to be hard to pull. I will also miss the leather mini cards that were numbered to 10. Having the paper framed parallel numbered lower this year may be nice. Because they were numbered so high last year, they were not hugely popular on the secondary market. Perhaps adding a new color with a lower serial-numbered could have been another solution. The Indian Head Penny set looks nice and should do well. I do wish the full 350-card set would have been paralleled, though, as the Stamps were last year. Regarding the minis, I do enjoy new parallels, but it will likely come at the cost to the regular mini set. That's the one most collectors seek. More parallels means more difficulty putting together the basic mini set. Last year, each box usually had 16 or 17 regular base set minis plus an additional six from the mini box topper pack, for a total of 22-23 basic mini cards. This year, with the addition of two new mini parallels and the subtraction of the regular mini cards in the box topper packs, each box should only yield 11 or 12 basic minis. Simply put, sets will not be as easy to build this year. Finally, not knowing the full checklist of relics and autographs will also have a huge impact on the overall value and excitement. This is the case with all products that have to-be-determined checklists. I am hoping the legends don't become extremely limited and see more common repeat signers take their place. I would like Topps Gypsy Queen have a nice run like Allen & Ginter has had and see it become one of the most anticipated releases of the year. This is a pivotal point for the brand. We will see if Gypsy Queen can become a regular staple within Topps' vintage-themed baseball card sets.